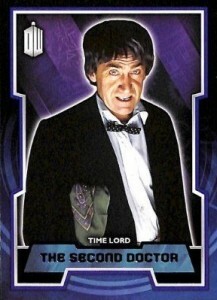 Over the years there have been plenty of sets of Doctor Who trading cards. However, the vast majority have been targeted at European audiences. A major set hasn't been released with North American audiences in mind since the show was rebooted in 2005. At least until now. 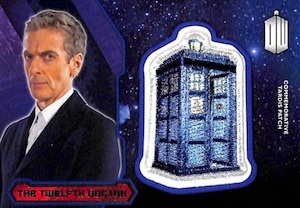 2015 Topps Doctor Who is a comprehensive set that covers the many angles of the reboot. Hobby boxes come with two hits or premium inserts such as autographs and relic cards. 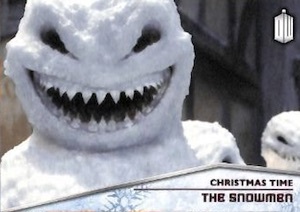 The 2015 Topps Doctor Who base set is large by today's standards, clocking in at 200 cards. 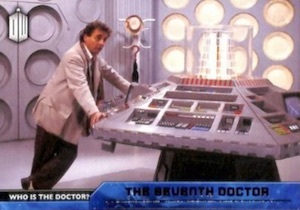 The majority of the base set focuses on characters, and is broken down into Doctors, Companions, Aliens and Villains. The final 35 cards cover every season of the show, with both the classic seasons and current series featured on Storyline cards. Parallels include Blue(#/199), Purple (#/99), Red (#/50) and Gold (1/1). There are also Printing Plates. The set is complimented by several basic inserts which total 50 cards and touch on both the recent and distant history of the show. Memorable Moments (1:2 packs) cover key points in the show's first five decades. Just as there have been several Doctor's over the years, they have been joined by several partners. Companions (1:4 packs) spotlights them. The Doctor Is In (1:8 packs) showcases each of the primary Time Lords. Finally, Christmas Time (1:6 packs) honors the holiday specials, while Gadgets (1:12 packs) documents all the cool gear. But what about the hits? Like the rest of the product, there's lots of variety. 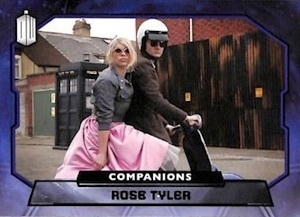 2015 Topps Doctor Who hobby boxes have two total premium inserts. Base Autographs feature both Doctors and his companions and more rarity is offered with Blue (#/50), Purple (#/25), Red (#/10) and Gold (1/1) parallels, as well as autographed Printing Plates. In addition to basic autographs, there are Dual Autographs and Triple Autographs. Relic cards come with a variety of items. On the memorabilia side, there are Costume Relics and Autographed Relics with wardrobe items used in the show. 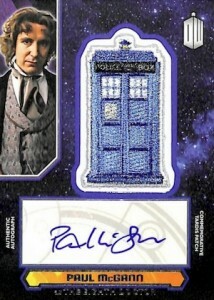 Collectors can also find TARDIS Patch Cards. These commemorative relics showcase the now-iconic time machine with multiple parallels, including Blue (#/100), Purple (#/50), Red (#/10) and Gold (1/1). There are also limited signed versions that are numbered to three. 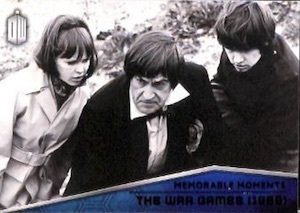 Doctor Who isn't totally new to Topps. Leading up to this release, they did Doctor Who Alien Attax and Doctor Who Alien Attax 50th Anniversary in 2013. Both sets are intended to be card games and were released primarily in Europe. At one time, Inkworks held the license for the show. And while they were able to release a few promos, they never got a full set to market before they went out of business. Shireen � Not yet. Have heard fall now but, at this point, it’ll be when it is. Cracks, Any idea of a price point? Matt � $80-85 per box. Ryan, have you heard anything about Topps forgetting the. labeling of the gold parallel 1/1s in this product? I recently got a Gold Parallel in one of my packs and it isn’t numbered. I only ask because while looking on ebay I had seen the same gold non numbered card for sale. Is there a number on them? Same with me @Stephen & @Matt , I pulled a GOLD, no number. After research it seems that these are 1/case as a SSP. Strange to have some many parallels like this, cause it does make one confused. Like me. 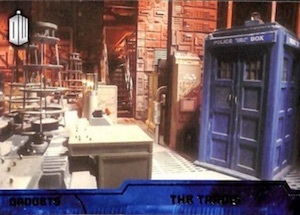 Jerry, Stephen, Matt � I reached out to Topps and there are limited TARDIS parallels that swap the DW logo for a TARDIS image in the corner. In addition to a basic version of this, there is also a Gold parallel. These Gold TARDIS parallels are limited to 50 copies. 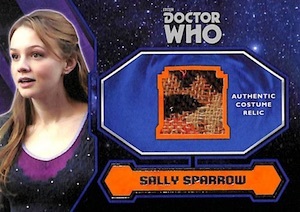 Just got the Sally Sparrow Costume card.So I watched the Episode Blink,but she wares nothing like that in the episode!So whats the deal?